Jacksonville homeowners looking to renovate a property or improve their home should not ignore the benefits of high-quality exterior blinds. Decorative shutters from Master Aluminum come in classic styles that perfectly match the aesthetic of Florida homes. The first thing someone notices when viewing your property is how it looks. A significant issue with other exterior blinds is their unattractive appearance and how the style fails to match the property. The exterior of a property can completely change with the look and feel. When dealing with things like renovations, homes can end up looking like a mix of various styles, designers, and plans. Looks can range from casual and contemporary to more traditional and rustic looks. To avoid issues with mismatching aesthetics, you can choose a neutral material like aluminum, which can blend into various homes. Metals take on paint easily, so you can match old and modern properties. Materials like aluminum also benefit from strong protective coats that do not easily peel off. Also, because of how smooth the metal is, unsightly bumps and errors are easier to correct. Depending on how you paint your decorative shutters, they can look natural like wood or more industrial for commercial properties. Also, wood requires more upkeep, repairs, and replacements over the years. Buyers in the Jacksonville area have to worry deterioration from rain more than other areas. Wood, while pleasant to look at, lacks the resistance that aluminum provides. Consumers within the Jacksonville area should avoid non-wholesale sources because they do not offer you a fair price. A wholesaler like Master Aluminum can provide individuals and sellers with high-quality aluminum blinds that are built to last. At Master Aluminum, we offer custom orders instead of cookie-cutter template sizes. Rather than having to rely on standard shapes, buyers can fit their decorative shutters to match commercial properties and homes alike. Our Foil Blade and Z Blade options provide the best in utility and style. Living in Florida means having to sometimes deal with strong winds. Wood and vinyl panels can sometimes crack under pressure to lose strength over time. All it takes is a strong storm to blow them away or break them off completely. With our custom extrusion designs, the structure is resistant to winds and being flung open. Also, if Jacksonville property has large windows, then you have to option to connect up to four panels. Our decorative shutters can also be customized in numerous ways. We offer bi-fold and tri-fold designs as well as dozens of colors. If you are installing decorative shutters by yourself, then having a lighter frame and blades makes your job easier. While individuals can purchase our high-quality Bahama or Colonial styles shutters, we do not provide installation. However, we can refer you to a reliable business in your area that can. If you choose to install the exterior blinds yourself, then a unified frame simplifies the task. Also, larger structures can weigh down on old brick and wood homes. Steel, while stronger than aluminum, is not as malleable. Many decorative shutters are vinyl because it is also lightweight. However, cheap vinyl panels can sometimes be challenging to paint and discolor quickly. The most significant benefit of using aluminum is that it is resistant to damage like corrosion from salt-sprays. If you live near the water, then water damage can quickly deteriorate wood. Researchers have found signs of salt damage to homes over five miles away from the coast. Aluminum, unlike other heavier metals like steel, does not rust. It also maintains a higher tensile strength than most inexpensive wood or plastic panels. Jacksonville buyers can also choose our hurricane-rated options in areas of strong wind. Non-high-velocity areas can reach wind speeds of up to 110 mph. While much of the Miami and direct coastal areas are in high-velocity zones, the majority of Florida is not. 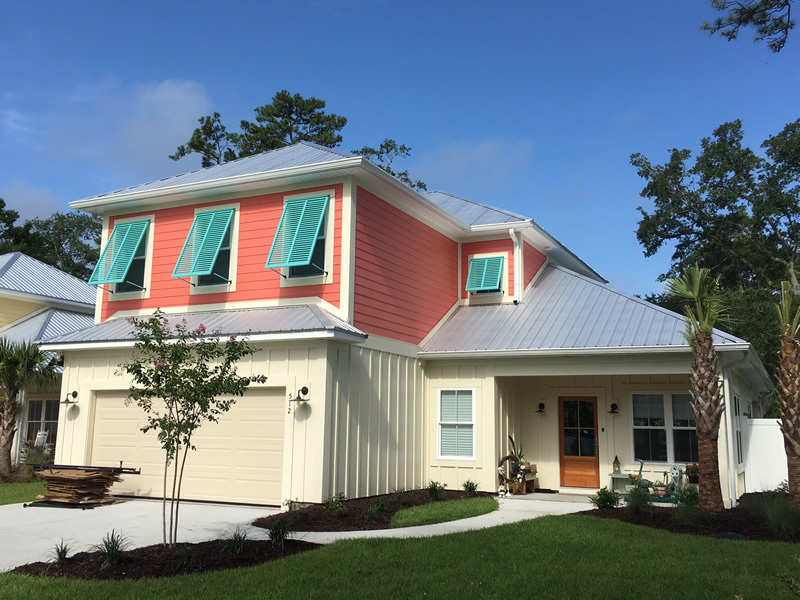 Jacksonville properties can protect windows and homes from dangerous debris with our Bahama or Colonial hurricane shutters. You can contact us today at (727) 725-1744 or online for wholesale decorative shutters and more.